When you find yourself enforcing too many rules in your office you must be assured that your principles have not been embraced, and the one who needs to embrace them the most is probably You - the leader. A fair amount of Brokers and Leaders live by the rule of ‘Do what I tell you; not what I do!’ – those are the Rule Makers and Rule Enforcers, they require authority to function, and sometimes fail to lead by example. Principles are driven by Values and Shared Vision, and if you must create rules for your business to grow make sure they are aligned with sound principles. Some Owners find it hard to delegate because they wish to control by making rules, therefore those they work with are not empowered to make Decisions, and everything has to end up on the plate of the owner; they then complain that they work too hard and no one really helps them at work. 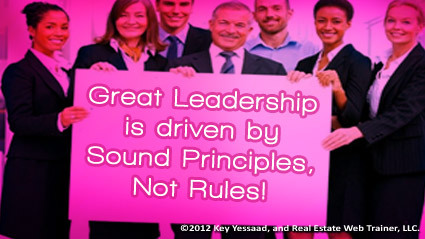 Enforcing Rules is easy, empowering others through sound principles is Leadership.